JEGS 1939 Ford Style Tail Lights are the most universally used tail lights in the custom street rod market. Functions as a running, turn and stop lamp. Available with or without the famous blue dot. Includes gasket/seal to keep out the elements and prevent tail lights from marring the paint. Also includes incandescent bulb (# 1157), socket and wiring harness. Sold individually, 1/pkg. Your tail lights are what others see when you go by. Not only do they add style to the rear of your vehicle, tail lights also implement an important safety function. 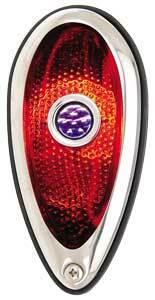 If you are trying to find tail lights for your classic or custom vehicle, we've got the light. Does JEGS 90001 fit your vehicle? 90001 is rated 3.0 out of 5 by 1.